Picking a laptop can be stressful, and the commitment can often feel like a long-term relationship. There are tons of options to choose from, in a wide variety of categories, from Chromebooks to Ultrabooks to mobile workstations. If you're looking for hassle-free computing optimal for web browsing and word processing, a Chromebook is likely your best bet. Now, here comes difficulty level two: selecting the right model. We've detailed the most important aspects to consider, and which laptops are best suited to meet your specific needs. Of course, if you already understand how to read a spec sheet, and you just need a rundown of the best Chromebooks available, we've got a nifty Best Chromebook buying guide compiled just for you. Thanks to our smartphones, we're all aware of gigabyte (GB) size. An entry-level iPhone has 16GB of storage, so use that as your point of reference for determining how much room you need on your new Chromebook. 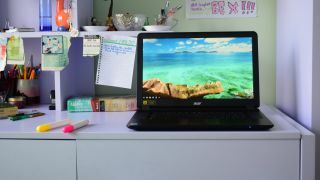 For vastly more storage, with a 320GB hard drive and 100GB of cloud storage, the Acer Chromebook C720 is your best bet. This isn't a solid-state drive, so it's louder than other Chromebooks but you will find you have ample space for all of your files. On the other hand, the entry level Toshiba Chromebook 2 only provides 2GB of memory and 16GB of storage. With the low memory specs significantly slowing down the process, we'd recommend avoiding this one, particularly if you run numerous tabs or web apps at once. With that being said, cloud storage now enables you to store your data without taking up any hard drive space. So, if you don't absolutely need your files living within your Chromebook, you can always purchase a device like the Toshiba Chromebook and upgrade your cloud storage capacity as your needs increase. Your laptop display is arguably the most important feature you'll explore. In general, the higher resolution the better. Typically Chromebooks are known for their relatively compact displays, generally maxing out around 14 inches with HD or full HD resolutions. If you're looking for one on the larger side with a resolution significantly above the pack, look at Toshiba's Chromebook 2 with a 13.3-inch full HD 1080p IPS screen. The picture is crisp and clear with bright, vivid colors and excellent viewing angles. Or you can go with our top-rated Chromebook, the Google Chromebook Pixel 2, which boasts a gorgeous 12.85-inch 2,560 x 1,700 IPS touchscreen display. On the other end, most entry-level Chromebooks, like the Dell Chromebook 11, boast 11.6-inch TN displays, which are admittedly not great. The Acer Chromebook 13 is a reminder that resolution isn't everything when it comes to display quality. While this laptop might have a full HD 1080p screen, the low-quality TN panel isn't very easy on the eyes. You do have plenty of usable room on the 13.3-inch display, bigger than most Chromebook options, but the colors and contrast are lacking and dull and the viewing angles are washed out as well. The worst part of it is that the Chrome OS doesn't scale up, leaving text on web pages difficult to read, and requiring heavy zooming to scan.